Narrative1 has capacity for 10 buildings, as well as new tools for calculating totals and averages of numeric data across multiple buildings. Further, the multifamily section has been expanded to allow for unit description and inventory counts for each building. Note: Rows and columns expand and contract depending on the number of buildings displayed. Note also, there is a "Auto" setting for row display. 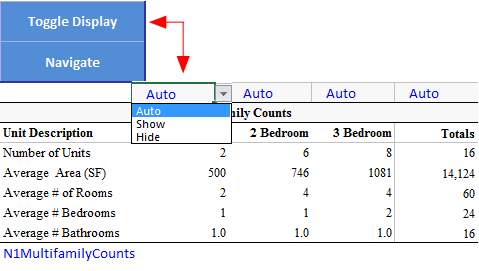 When Auto is selected, the row will show or hide automatically is there are multiple buildings. When multiple Buildings are displayed, the Totals & Averages column is also displayed, with averages displayed in italics. 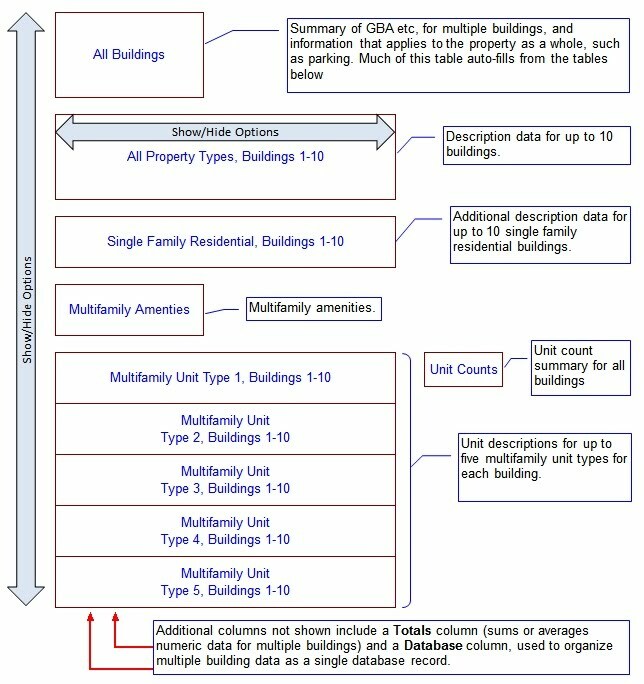 When working with a multifamily property, these counts can be automatically populated from the multifamily tables below. These tables do a number of calculations automatically, so careful data entry is important. Of particular note is the room count convention. Because Excel will automatically convert entries with dashes or slashes to a date (for example, 4-2-1 and 4/2/1 will be converted to 4/2/2001), Narrative1 uses periods to separate the room counts (for example, 4.2.1). With multiple buildings, Narrative1 will calculate averages for that unit type. This table is located to the right of Building 10, Unit Type 1 and provides another view of the unit, room and bathroom counts and total areas for all buildings. Because there are potentially several Buildings (up to 10) associated with the subject, Narrative1 gives the analyst a choice of how to organize the data as a single database record via the Method selection. Note: If there is only 1 Building, Narrative1 will automatically use the information for Building 1 as the database record. The following narrative provides additional information for some improvement description inputs and fields, but not all. 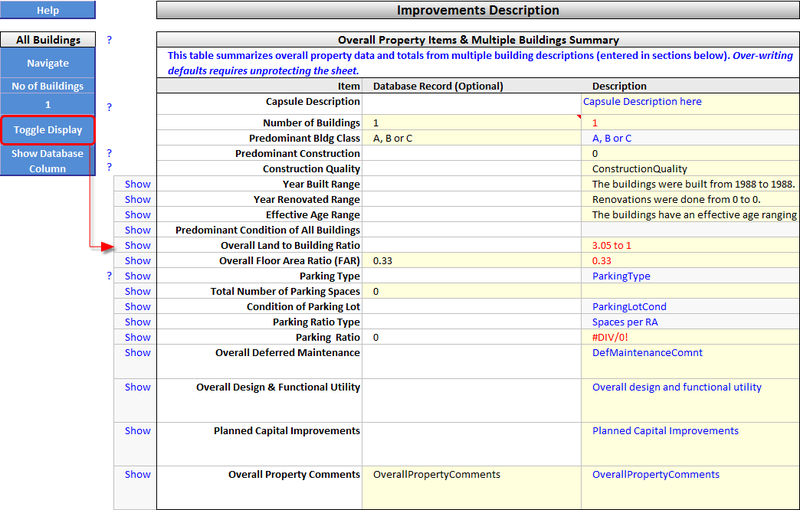 The "All Buildings" section summarizes improvement data that applies to multiple buildings and/or data that is not necessarily building specific. In cases where the data is different among various improvements, enter the predominant characteristic. For example, if the property is generally in good condition, but has a minor component that is in average condition, it would be appropriate to describe the property as average condition as that would be predominant. Use the Comments field to elaborate for the reader. The various counts will depend on the type of property described in the tables below the "All Buildings" table. For example, if the property type is multifamily, the counts should pull from the multifamily tables, not the General building description table. Or, if the property is commercial, the counts should pull from the General building description table. The subject is a 12 year old single tenant industrial property in average condition. The gross building area is 12,000 square feet on one acre of land. *For capsule description purposes, land is included; this section is otherwise dedicated exclusively to improvements. Predominantly used to describe office buildings - ignore for other property types. The following definition is from The Dictionary of Real Estate Appraisal, 4th ed. (Chicago: Appraisal Institute, 2002). For the purposes of comparison, office space is grouped into three classes. These classes represent a subjective quality rating of buildings, which indicates the competitive ability of each building to attract similar types of tenants. Combinations of factors such as rent, building finishes, system standards and efficiency, building amenities, location/accessibility, and market perception are used as relative measures. Class B office buildings compete for a wide range of users, with rents in the average range for the area. Building finishes are fair to good for the area and systems are adequate, but the buildings do not compete with Class A buildings at the same price. Class C office buildings compete for tenants requiring functional space at rents below the average for the area. Enter a brief description of the building. For example: A three story office building. Construction class, construction quality, size, floors, etc., are described in subsequent tables. The total floor area of a building, including below-grade space but excluding unenclosed areas, measured from the exterior of the walls. Gross building area for office buildings is computed by measuring to the outside finished surface of permanent outer building walls without any deductions. All enclosed floors of the building including basements, mechanical equipment floors, penthouses, and the like are included in the measurement. Parking spaces and parking garages are excluded. The amount of space on which the rent is based; calculated according to local practice. The total floor area designed for the occupancy and exclusive use of tenants, including basements and mezzanines, and measured from the center of interior partitioning to outside wall surfaces; the standard measure for determining the size of shopping centers where rent is calculated based on the GLA occupied. The area for which tenants pay rent. This field is for describing the larger or overall property, focusing primarily on improvements and use. 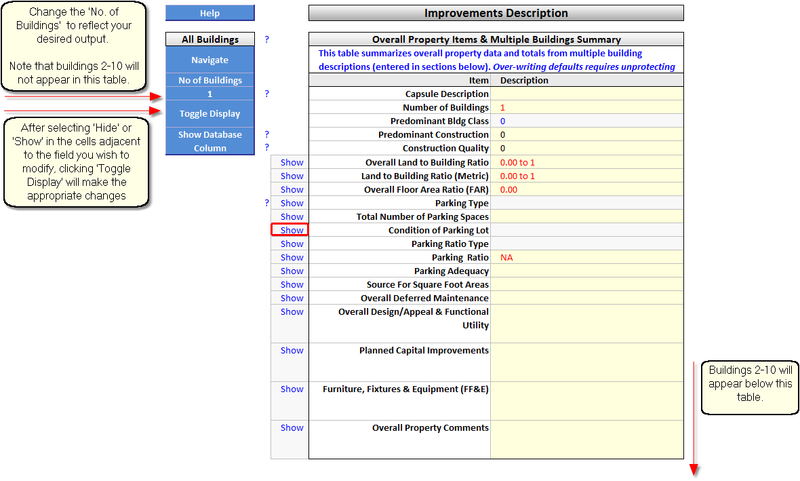 Use the Building Description Comments field to elaborate on items more specific to the individual building(s). Wet Water: A wet system always has the pipes filled with water. Dry Water: A dry system does not fill up with water until alarm is triggered. System is slower reacting but is less susceptible to freezing or contents water damage from leaks. Chemical: Non-water based fire retardant is used; Typically used in high tech environments where there is a lot of electricity exposure and/or high-value contents are extremely vulnerable to water corrosion. Other: All other fire sprinkler types. Same as Remaining Economic Life, meaning the estimated period during which improvements will continue to contribute to land value. Buildings are divided into five basic groups by type of frame (supporting columns and beams), floor, roof and walls. A - Frame is structural steel columns and beams, fireproofed with masonry, concrete, plaster, or other noncombustible material. Floors are concrete or concrete on steel deck, and fireproofed. Roof is formed concrete, precast slabs, concrete or gypsum on steel deck, and fireproofed. Walls are non-bearing curtain walls, masonry, concrete, metal and glass panels, stone, steel studs and masonry, tile or stucco, etc. B - Frame is reinforced concrete columns and beams, and of fire-resistant construction. Floors are concrete or concrete on steel deck, and fireproofed. Roof is formed concrete, precast slabs, concrete or gypsum on steel deck, and fireproofed. Walls are non-bearing curtain walls, masonry, concrete, metal and glass panels, stone, steel studs and masonry, tile or stucco, etc. C - Frame is masonry or concrete load-bearing walls with or without pilasters; masonry,concrete or curtain walls with full or partial open steel, wood, or concrete frame. Floors are wood or concrete plank on wood or steel floor joists, or concrete slab on grade. Roof is wood or steel joists with wood or steel deck; or concrete plank. Walls are brick, concrete block, or tile masonry, tilt-up, formed concrete, non-bearing curtain walls. D - Frame is wood or steel studs in bearing wall, full or partial open wood or steel frame, and primarily combustible construction. Floors are wood or steel floor joists or concrete slab on grade. Roof is wood or steel joists with wood or steel deck. Walls are almost any material except bearing or curtain walls of solid masonry or concrete, and generally combustible construction. S - Frame is metal bents, columns, girders, purlins and girts without fireproofing, and of incombustible construction. Floors are wood or steel deck on steel floor joists, or concrete slab on grade. Roof is steel or wood deck on steel joists. Walls are metal skin or sandwich panels, and generally incombustible. The overall physical state of building and site improvements; function of age, nature/quality of improvements and maintenance program. Based upon local market standards. Arched - A roof with a convexly curved vertical span of steel, concrete, stone, or wood; a roof section with end base supports designed to support itself, the superstructure, and the attached or suspended structure. Barrel Shell - A roof configuration with one or more semi-cylindrical roof sections, also referred to as barrel vaults. Dome - A hemispherical roof or ceiling constructed to exert equal, oblique thrust in all directions. Flat - A roof with just enough slope to provide for proper drainage; one with a pitch that does not exceed 20 degrees. Folded Plate - A roof configuration with one of more Z-shaped roof elements to provide overhead natural light. Gable - A ridged roof, the ends of which form a gable. Gambrel - A ridged roof with a side that has two slopes, with the lower slope the steeper. Hip - A roof with sloping sides and end slopes that are connected by a ridge, the length of which is called a run; distinguished from a pyramid roof in which all slopes meet so that virtually no ridge remains. Mansard - A roof with two slopes or pitches on each of the four sides, with the lower slopes steeper than the upper slopes; provides a good base when another story is added to a building. Sawtooth - A roof with serrated cross-section whose shorter, steep or vertical sides have fenestration for light and ventilation. Other - All other roof types.